- Compact, Flat design, High strength, heat treated alloy steel body for better life. - Compact and flat design for use where in a narrow space. - Mounting holes permit easy fixturing. - Grooved plunger ends require no saddle. Rectangular Flat Jack: High deformability, max. Pressure 50 bar, dimensions 400 X 200 X 4 mm. Steel sheet 0, 8 mm thick. Complete with nuts and groins. 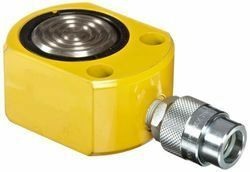 We are operating as the leading wholesaler and distributing Enerpac of Flat Hydraulic Jack , which is used for providing a flat surface for forklifts and trucks for transferring loads. This product is made from high quality material and has been procured from a reliable vendor base. It is exceptional in tensile strength and can be installed easily. - Compact and flat design ideally suited where clearance is minimum for insertion of jack. - Mounting holes for easy fixturing. Used for structural weld positing, rigging in bridge construction, heavy fabrication and maintenance. - Caution-Provide level and solid support for entire jacks base area since the ram guide length is small. 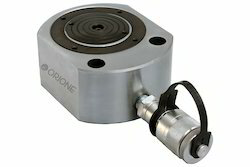 APPLICATIONS : These jacks are designed specifically where space is a constraint. Ideally used where no other cylinders will fit for lifting, lowering, spreading of structures, bridges, heavy machinery etc. Flat Jacks incorporate the Optimum Stroke in the minimum closed height to give lifting force in confined places of work. Strokes being very limited and the area of working being almost inaccessible, extra care should be taken to ensure that the piston does not exert load on the gland nut, Mounting bolt holes are provided for positive fixing. - Mounting holes for easy fixturing. Used for structural weld positioning, rigging in bridge construction, heavy fabrication and maintenance. - Caution - Provide a level and solid support for entire jack base area since the ram guide length is small. Power Team 10 Ton Flat Jack. - Manufacturer - SPX Power Team.